Surprisingly, shockingly, and against all odds, I was commissioned with making the desserts for our Thanksgiving last year, way back in twenty-eleven. Yes, I'm just posting about them now, over two months later. Judge not lest ye be judged. The cake was an aptly-titled duchess* spice cake, fragrant with cinnamon, ginger, and cloves. To moisten the cake, I applied a cinnamon-infused simple syrup to each layer. The finishing and, dare I say it, finest touch was a brown sugar cream cheese frosting. How I, an avid lover of cream cheese frosting, have managed to miss this more mellow and flavorful variation is beyond me. It's amazing, and I recommend it (and this particular cake-frosting combination) 100%. *On an unrelated note, the name of this cake calls to mind a show that I'm happy to say I adored way before it became the thing to do. Matthew and Mary, I'm pulling for you crazy kids! Preheat oven to 350 degrees F. Grease and flour two 9-inch cake pans. Sift flour, sugar, baking soda, cinnamon, ginger, cloves, and salt together. In a mixing bowl, cream together the sugars and butter. Add eggs, one at a time, beating well after each addition. Beat in the dry ingredients alternating with the buttermilk and mix just until incorporated. Beat in vanilla. To make the simple syrup, add water and cinnamon to a small pot and bring to boil. Simmer for 10 minutes, and strain out cinnamon sticks. Bring water back to a boil, add sugar and stir until sugar is dissolved. To make the frosting, beat butter, cream cheese, and brown sugar until smooth. I felt the need to add a little sifted powdered sugar to obtain the proper spreading consistency, but use your own judgment. To assemble, liberally brush the four sides of exposed cake with the simple syrup. Slather the frosting between the halved and syruped layers (stacking as you go), then frost the sides and top in a decorative fashion. Chill for a bit to let things mingle, then slice and serve! A splendid cake! Dively spicy and so well decorated. Gorgeous, gorgeous cake Grace...it is amazing. I'm with you on the brown sugar frosting. I had not had it until a couple of weeks ago and found it so additive! And the show with Matthew and Mary also has me addicted. It was a long summer waiting for season 2. Sounds delicious and so prettily decorated! Not only is this cake beyond gorgeous, but it sounds mighty tasty as well!! That is nothing short of spectacular. And it has all the good spices in it. What an elegant cake! Those swirls are so pretty. If the inside tastes as good as the outside looks, this must be one terrific cake. I love the decoration. I've been hearing about that show - I'll have to give it a try. This cake not only looks beautiful but it sounds A.M.A.Z.I.N.G! The frosting sounds yummy too. Better late than never (a concept I'm particularly drawn to at My Own Sweet Thyme)! That cake is truly gorgeous and sounds soooo appealing. I would absolutely love a taste. The brown sugar in the frosting is a wonderful thought. Don't know why I've never tried it. I will now! So going over to the dark sugar side of things with my next batch of frosting. Thanks (giving!) for the wonderful idea. I'm quite impressed with your cake decorating skills! Almost looks too good to eat but don't worry, I would totally be the first one with fork in hand. I would LOVE that cake. And I'm a pie girl. Really girl? You're killing me. And by killing me I mean...can't we celebrate Thanksgiving again next week so I can make this? I'm totally in awe of your decorating talent! Your cake is a beaut and I'm certain got oh's and ah's when presented. Of course, it helps to have all those luscious spice fragrances wafting about. This cake looks absolutely divine. I love spice cakes and rarely find a good recipe. I will definitely be trying this one out! Ooh I love that there's ginger and cloves in this cake. And it's SO pretty, too! You go ahead and toot that horn girl!!!!! That cakes looks as moreish as an episode of Downton Abbey. Well done! A.maz.ing. Period. Well, not period. I love Downton Abbey too (but am still in season 1). And I love the look of this cake. You've got a real gift, Grace! That is a dressed-up, fancy cake! It sounds like cinnamon heaven. Now, I have to try brown sugar in a cream cheese frosting. You did a fabulous job decorating this! That is one STUNNING cake! 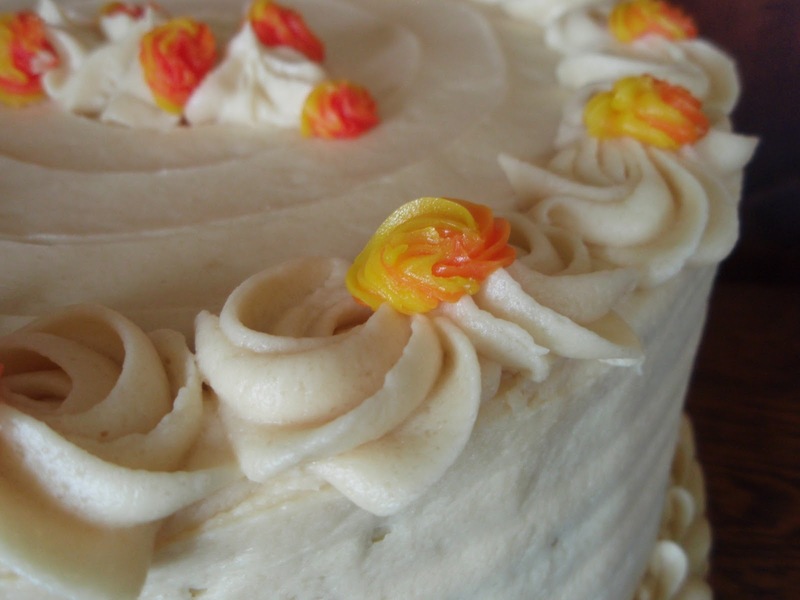 I love the idea of soaking the layers with a cinnamon simple syrup, and a brown sugar cream cheese frosting? I would've eaten the whole cake! The frosting sounds just divine. And your decorations are always so pretty, unlike mine, which are nonexistent. In my house, you take your dang frosting and be happy. well my stars ms grace, that, is one mighty fine looking cake. wow. A delicious and lovely looking cake! What a fabulously festive decorated cake! A sugar rush is just what I need right now. I am craving some cream cheese frosting. Is it bad that I want to forgo breakfast and make this now? It's gorgeous and packs a few of my favorite flavors! Beautiful cake!!! !The cinnamon syrup sounds delicious! sounds delicious, I love all of those spices and think that brown sugar cream cheese frosting sounds like such a gorgeous combination. Impressive decorating skills too! Gorgeous! 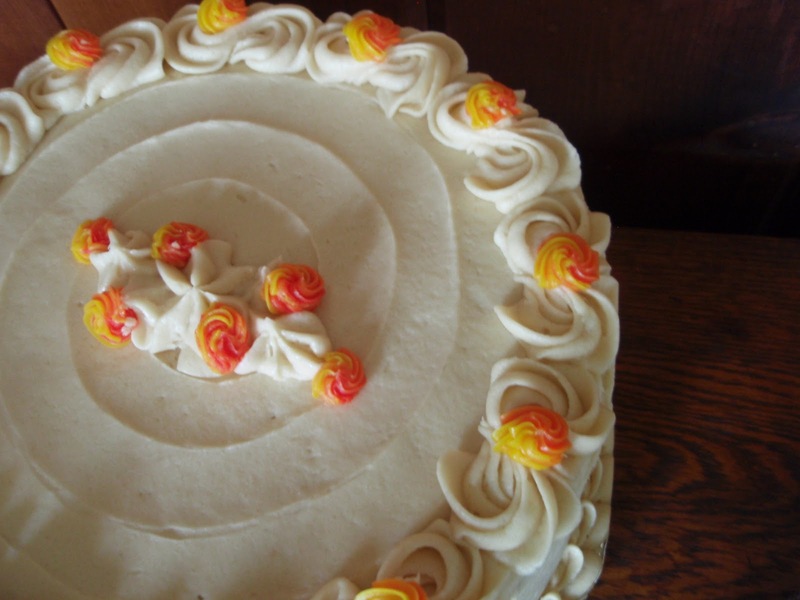 I really like the idea of a brown cream cheese frosting! A cake well deserving of a promotion! I would love a slice with some tea while I watch M&M straighten out their lives. This sounds positively heavenly! And can I just say that you are a master froster? You swirled it absolutely perfectly; not a single sugar crystal out of place. This cake looks so delicious and gorgeous! That is one magnificent cake for sure! I love the spices you are using here. Happy valentine's day! Such a beautiful cake Grace! You certainly have a knack for frosting. I love the colours. Sounds like it tasted pretty sensational too. What an amazing cake Grace! It's a beauty to look at and I'm sure it tasted amazing! How pretty! And brown sugar cream cheese frosting? That sounds divine. I tried to make brown sugar frosting once and it was crunchy. I guess I didn't whip it long enough??? The cake is so pretty and the name is perfect. Hello, I came to reciprocate his visit to my kitchen! Beautiful your words, thank you! This recipe is delicious, I love your blog I'll visit more often! kisses.